The demonstrators, who later posted images of the clashes on social media, said their aim was to publicly condemn the president’s policies in Turkey, Syria and Iraq. Some protesters carried flags and banners in support of the Kurdish militant group, the Kurdish People’s Protection Units (YPG). Mr Erdogan sees the YPG as an extension of the banned Kurdistan Workers’ Party (PKK), which has fought for Kurdish autonomy in Turkey for three decades. He has repeatedly said that he will never accept a US alliance with Kurdish forces fighting in Syria. Supporters of Mr Erdogan can be heard shouting the president’s name in the footage, in attempts to muffle the protesters’ chants. One protester, Meghan Bodette, wrote on Twitter that she had been “thrown out” of the hotel. The YPJ is an all-female Kurdish military group – the women’s equivalent of the YPG. Another Twitter user, Gissur Simonarson‏, posted images taken from amateur video footage showing a number of protesters being violently attacked. 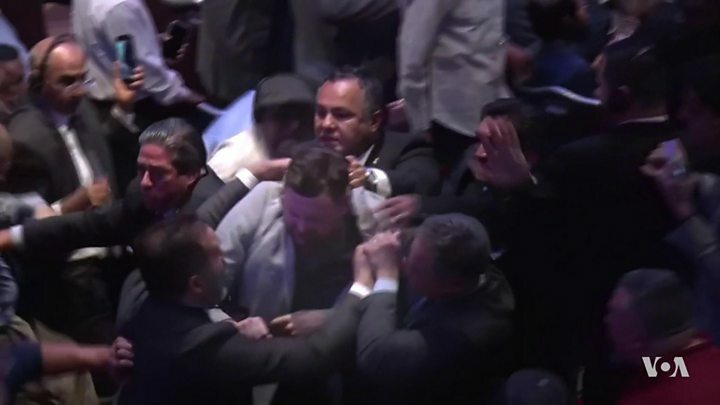 One eyewitness, Halil Demir, said he saw a man being pushed to the ground after interrupting Mr Erdogan’s speech. Mr Demir said he later saw a second man outside the hotel in handcuffs on the floor, the New York Times reports. Mr Erdogan was speaking at the invitation of the Turkish American National Steering Committee. The New York Police Department said that about five protesters had been “briefly detained” but that no arrests were made. 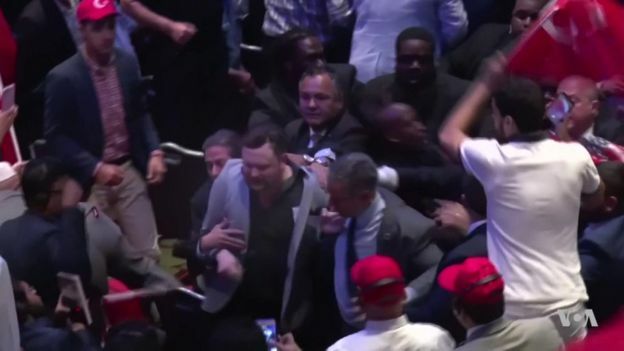 In May, eleven people were injured and two arrested outside the Turkish ambassador’s residence in Washington DC, after a brawl broke out between supporters and opponents of Mr Erdogan. The US summoned the Turkish ambassador over the incident, which Washington police called a “brutal attack on peaceful protesters”. 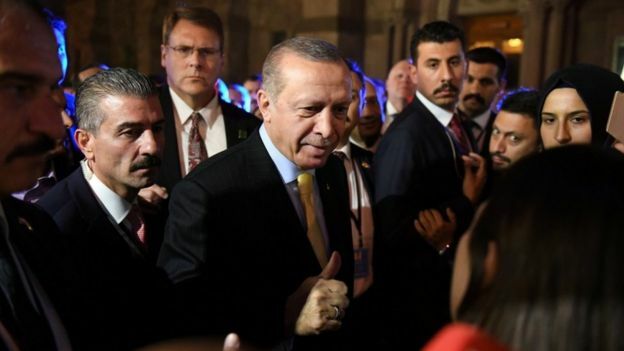 The Turkish embassy denied that, saying the demonstrators had aggressively provoked Turkish-Americans gathering to greet Mr Erdogan, and that they had responded in self-defense. (CNN) The Turkish military on Tuesday killed more than 20 members of Kurdish militia groups, some of which the United States is assisting in the fight against ISIS. Five of the casualties were among Kurdish fighters in northern Iraq, known as Peshmerga. Others were reported by the YPG, a Kurdish group in northern Syria. Both groups have proven to be some of the most effective fighting forces on the ground against ISIS. Yet Tuesday’s airstrikes exposed the complicated tangle of Kurdish militant groups in the region, and the tough choices that the United States faces in its regional alliances in the battle against ISIS. The five Peshmerga fighters were killed apparently in error when Turkish warplanes carried out airstrikes on nearby positions of another group that Turkey considers to be terrorists, the Kurdish Workers Party, or PKK, which is usually based in Turkey. The strikes hit at dawn on Mount Sinjar, west of Mosul, Iraq, according to a spokesman for the Peshmerga ministry. Nine others were injured and transferred to a nearby hospital. The Peshmerga later released a statement blaming the strikes on the presence of the PKK group, which it said it has long asked to leave the Mount Sinjar area. “One of our Peshmerga military posts is located very close to the airstrikes and was hit by mistake,” Halgord Hikmat, spokesman for the Peshmerga ministry, told CNN. YPG militia members were also killed in Turkish airstrikes Tuesday. A YPG spokesman said in a later statement that 20 fighters were killed and 18 others wounded. But it’s not clear if all the dead and injured were members of YPG, or People’s Defense Units. A YPG fighter surveys the site of Turkish airstrikes Tuesday in northeastern Syria near Turkey. “We as the People’s Defense Units say that this cowardly attack will not discourage our determination and our free will to fight and confront terrorism,” the YPG said. The YPG is a key component of the Syrian Democratic Forces — backed by the United States in the fight against ISIS in Syria. Those forces have been closing in on the ISIS stronghold in Raqqa. But Turkey opposes the YPG because it fears Kurdish separatism. Turkey’s operations Tuesday were targeting the PKK, which Ankara, the United States and the European Union consider to be a terror group. For decades, Turkey has been facing a violent insurgency from the PKK — a banned group that first took up arms in 1984 seeking an independent state for the Kurdish minority concentrated in the country’s southeast. Turkey has often suggested that the PKK and YPG operate closely, although the YPG denies such ties. Tuesday’s airstrikes were not the first time that Turkish warplanes have targeted PKK positions in Iraq and Syria. 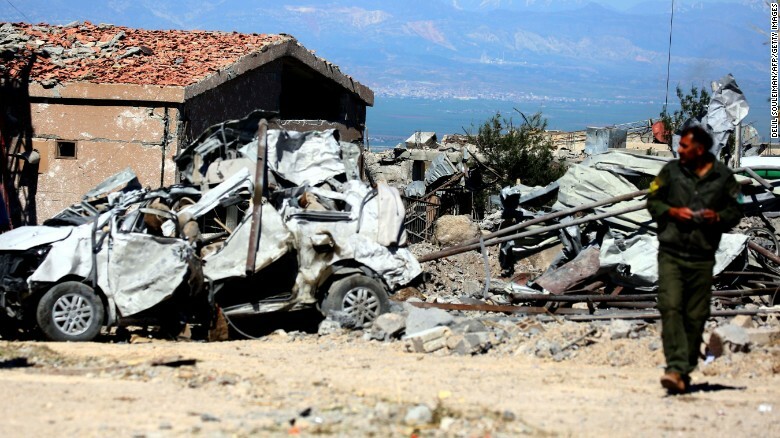 In a statement issued via Turkey’s state-run news agency, Anadolu, the Turkish General Staff said the airstrikes hit PKK targets in both countries. It described the strikes as a “counterterrorism” operation “within the scope of the international law” to prevent the PKK from sending “terrorists, arms, ammunition, and explosives” to Turkey. CNN’s Tamara Qiblawi also contributed to this report. Istanbul (CNN) Turkish authorities said Wednesday they have identified the gunman who killed 39 people in the New Year’s nightclub terror attack in Istanbul. Authorities have also detained 20 alleged members of ISIS in connection with Sunday morning’s attack at the Reina nightclub, state-run news agency Anadolu reported Wednesday. 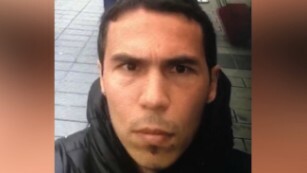 The “selfie video” featuring the man in Istanbul’s Taksim Square was first posted on a pro-ISIS Telegram account before Turkish media broadcast it, said Laith Alkhouri, a director at Flashpoint, an American business risk intelligence company tracking terrorist and cyber threats. Alkhouri told CNN that such a release suggests the attacker was part of a network supportive of or linked to ISIS, and that he had shared the selfie footage with the terror group before or after the attack. On Tuesday, Interior Minister Suleyman Soylu told lawmakers that Turkish security forces had prevented 339 major terror incidents in 2016 — 80 of which came in the final three months of the year. In his speech to parliament, Soylu cited attacks launched by the militant Kurdistan Workers’ Party, or PKK, as well as those by Daesh, the Arabic term for ISIS. He said that 247 improvised explosives and 61 bomb vehicles had been seized in 12 months. He also revealed the capture of 23 suicide bomber suspects as well as 42 terrorist group members who were preparing for attacks. Both ISIS and Kurdish militants have launched attacks in Turkey, which is reeling from a failed military coup in July. 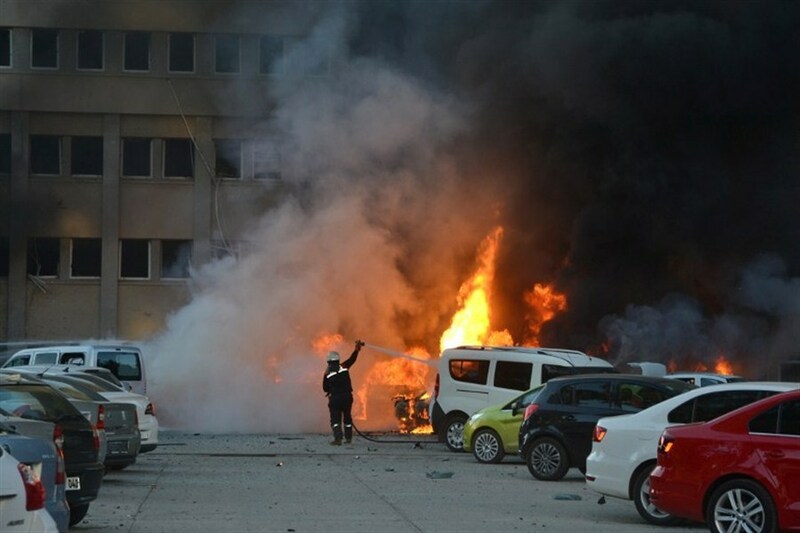 On Wednesday, Anadolu reported that authorities arrested four people, including a woman, in connection with a December 17 car bombing that killed 13 soldiers and wounded dozens in the central city of Kayseri. At least 11 victims in this week’s attack on the upscale nightclub were from Turkey, according to Anadolu, while at least 27 victims hailed from 13 other countries, including Lebanon, Iraq, Syria and Canada. Witnesses described how the New Year’s Eve celebration turned into a bloodbath. “We were having fun. 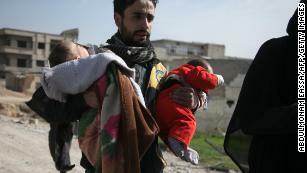 At first we thought it was a fight, then there was a lot of gunfire,” Yunus Turk told CNN. CNN’s Ian Lee reported from Istanbul, and James Masters wrote from London and Jason Hanna from Atlanta. CNN’s Marilia Brocchetto, Schams Elwazer, Hande Atay Alam, Sarah Sirgany, Julia Jones and Onur Cakir contributed to this report. Twenty nine people were killed — mainly police officers — and 166 wounded in double bombings that struck Istanbul on Saturday after a home football match hosted by top side Besiktas, Turkish interior minister Suleyman Soylu said.Twenty-seven of those killed were police and two were civilians, he told reporters in Istanbul, adding that 10 suspects had already been detained over the bombing. A car bomb detonated outside the Vodafone Arena football stadium on the shores of the Bosphorus after the Super Lig match between Besiktas and Bursaspor while a suicide attacker struck a nearby park, officials said. The authorities did not say who was behind the blasts but the attacks were the latest in a year that has seen Istanbul and other Turkish cities rocked by a string of attacks blamed on Islamic State jihadists and Kurdish militants. The health ministry said in a statement that 15 people were killed and 69 wounded. “An act of terror targeted our security forces and citizens at Besiktas tonight,” President Recep Tayyip Erdogan said in a statement. Besiktas is also the name of the neighbourhood around club’s arena. Erdogan said the blasts shortly after the end of the match sought to cause maximum loss of life. “We have witnessed once more here in Istanbul the ugly face of terror which tramples down any form of value and morals,” he said. Interior minister Suleyman Soylu said one blast took place outside the stadium and another at Macka Park, a popular meeting place just above the sports venue. He said the stadium attack targeted a bus of riot police. State broadcaster TRT showed images of the wreckage of a car, engulfed in flames with emergency services swarming around the scene outside the sports venue. “I heard two explosions in less than one minute, followed by the sound of gunshots,” one witness told AFP on condition of anonymity. Besiktas football club issued a statement condemning the attack and confirming none of the fans or players were hurt. Police cordoned off the area around the stadium immediately after the blasts, which occurred near the Ottoman-era Dolmabahce palace that houses Prime Minister Binali Yildirim’s offices in Istanbul. The scene is also about a kilometre (0.6 miles) from the busy Taksim Square, a magnet for tourists. Erdogan was in Istanbul at the time of the blast at his residence in the suburb of Tarabya further down the Bosphorus, state media said. The government slapped a broadcast ban on footage of the attack, as is becoming typical in the aftermath of major incidents in the country. There was no immediate claim of responsibility for Saturday’s attack. In his statement, Erdogan said that “the name or the method of the terrorist organisation which perpetrated the vile attack” did not matter. “Nobody should doubt that we will defeat terror, terror groups, terrorists and of course the forces behind them, with God’s help,” he said. In June, 47 people were killed in a triple suicide bombing and gun attack at Istanbul’s Ataturk airport, with authorities blaming IS. But there have also been deadly bombings claimed by the Kurdistan Freedom Falcons (TAK), seen as a splinter group of the outlawed Kurdistan Workers Party (PKK). Saturday’s attack came after the Turkish army and its Syrian rebel allies on Saturday entered the IS bastion of Al-Bab in northern Syria, according to a monitoring group. Al-Bab is the last bastion IS has in Syria’s northern Aleppo province. The explosions also came hours after Turkey’s ruling party submitted a parliamentary bill that would expand the powers — and possibly the tenure — of Erdogan, a move his opponents fear will lead to one-man rule. While Defense Secretary Ashton Carter prepared for his trip to Turkey, a senior Iraqi general on Wednesday called on Iraqis fighting for the Islamic State to surrender as a wide-scale operation to retake Mosul entered its third day. Story. Mr. Erdogan’s remarkable outburst was the latest sign of difficulties the Obama administration faces in keeping the various members of its regional coalition pushing in the same direction in the fight to oust the Islamic State from its strongholds in Iraq and Syria and find a way to end Syria’s bloody civil war. The Obama administration has long sought to control Turkish involvement in the Iraq fight amid fears of a clash with American-aligned Kurdish forces near Mosul, but Mr. Erdogan threatened Wednesday to take unilateral action ifTurkey’s interests were threatened by chaos spilling from the battle to reclaim Iraq’s second-largest city. “From now on, we will not wait for problems to come knocking on our door, we will not wait until the blade is against our bone and skin, we will not wait for terrorist organizations to come and attack us,” Mr. Erdogan said in a fiery speech from his presidential palace in Ankara. His comments prompted concern among U.S. officials already wary about a series of provocative moves by Mr. Erdogan that analysts say have been driven — at least in part — by a desire to pressure Washington into giving Turkey its way against Syrian and Iraqi Kurds. Mr. Carter’s visit will also be his first to Ankara since a failed military coup nearly ousted Mr. Erdogan and his ruling AKP party from power this summer. While Turkey remains a major NATO ally, Mr. Erdogan raised eyebrows in the West last week when he suddenly invited Russia to bid on providing his nation with its first-ever long-range air and anti-missile defense system. The Pentagon declined to comment Wednesday on whether Mr. Carter will raise the issue during his visit to Turkey. But it is likely to add to the thick tension over the Kurdish issue. Turkey has long battled the separatist Kurdish PKK movement in its south and fears an independent Kurdistan across the border in Iraq will only inflame the fight. The Obama administration has relied on Kurdish militias to fight the Islamic State in both nations, but the Erdogan government views many of them as terrorists no less threatening than the group that has held Mosul and other territory in northern Iraq and Syria for the past 2 years. “Erdogan is trying to leverage political gain, and he wants Turkish troops in northern Iraq,” said Michael Rubin, a scholar with the American Enterprise Institute and a former Pentagon official. Turkish Prime Minister Binali Yildirim made headlines Tuesday by claiming the country had reached an agreement with U.S. commanders to allow Turkish fighters to carry out airstrikes in Mosul against the Islamic State, also known as ISIS and ISIL. Turkish F-16 fighters based out of Incirlik Air Base, near the country’s southern border with Iraq, would execute airstrikes in Mosul under the command of the country’s military command node in Kuwait, Mr. Yildrim told the Hurriyet Daily News. The Iraqi government of Prime Minister Haider al-Abadi has protested Turkish military actions inside its borders. U.S. defense officials told The Washington Times on Wednesday that no such agreement had been reached withAnkara on military air operations in Mosul. “It’s not true,” one defense official said, noting there had been only one instance of Turkish aircraft entering Iraqi airspace — a surveillance drone — since the country’s forces deployed to northern Iraq. Additionally, Russia has warned Turkish forces advancing through the Syrian border town of Jarablus to halt their advance south or risk being targeted by Russian aircraft operating in the country, the official added. Russia is allied with Syrian President Bashar Assad, a longtime adversary of Turkey. Even if a military coordination deal included Turkey, it would require Iraq to sign off because any offer of foreign military support in the campaign against the Islamic State needs Baghdad’s approval, a second U.S. defense official told The Times. Army Maj. Gen. Gary Volesky, commander of U.S. and coalition land forces in Iraq, said at the Pentagon on Wednesday that there were no orders directing Turkish fighters to take part in the fight for Mosul. Roughly 300 to 400 Turkish soldiers are stationed at a small training camp outside Bashiqa, northeast of Mosul. Reports say smaller Turkish units are scattered across the city’s northern and eastern borders. Turkish units have been training and equipping Sunni militias in the region, preparing them to defend against any threats posed by Kurdish members of the People’s Protection Unit, also known as the YPG, the armed faction of the Kurdish Workers’ Party in northern Iraq. Ankara considers the group to be on par with the Islamic State and other terrorist organizations. U.S.-Turkish ties in the fight against the Islamic State began to fray in June, when Washington rebuffed an offer byTurkey to conduct joint operations to retake the strategically critical northern Syrian district of Manbij. Since then, U.S. diplomats and defense officials have repeatedly tried to engage with their Turkish counterparts to quell any tensions among Washington, Baghdad and Ankara, the second defense official said. But Pentagon officials say Mr. Erdogan’s recent tough talk is aimed less at the U.S. and Mr. Carter than at concerns over the fallout once the Islamic State is driven from Mosul. The caustic rhetoric coming out of Ankara over the past several weeks did not start “until [Mr. al-Abadi] announced the operation” to retake Mosul, one official added. Turkey’s demand for a role in the Mosul fight has overshadowed its outreach toward Russia, which has generated growing concern among officials in Washington. According to a Defense News report, Mr. Erdogan made the surprising move last week to invite Moscow to bid on a contract to provide a long-range air and anti-missile defense system for Turkey — three years after Ankara disqualified a Russian bidder. Turkey’s pursuit of the system has been bumpy since 2013, when Ankara took bids from U.S., French and Chinese companies before selecting the China Precision Machinery Import-Export Corp. to provide the air defense architecture. But the deal with the Chinese was suddenly canceled amid heated criticism from Washington and other NATO allies. One American official who spoke on the condition of anonymity Wednesday said U.S. officials were warily monitoring Mr. Erdogan’s call for a Russian bid ahead of Mr. Carter’s visit. However, the official suggested that the Obama administration thinks it is highly unlikely that the Turks will go through with deal with the Russians. But Turkey’s overtures toward Russia may be more than just posturing, Mr. Rubin said. In addition to Turkey, the Pentagon said, Mr. Carter will stop in the United Arab Emirates, France and Belgium to meet with “key partners in the campaign to deliver [Islamic State] a lasting defeat.” He plans a major speech on the future of NATO next week in Brussels. Turkey’s Erdogan Will Not Tolerate Peace With The Kurdish People! The Turkish military said its jets conducted 26 raids Wednesday night. 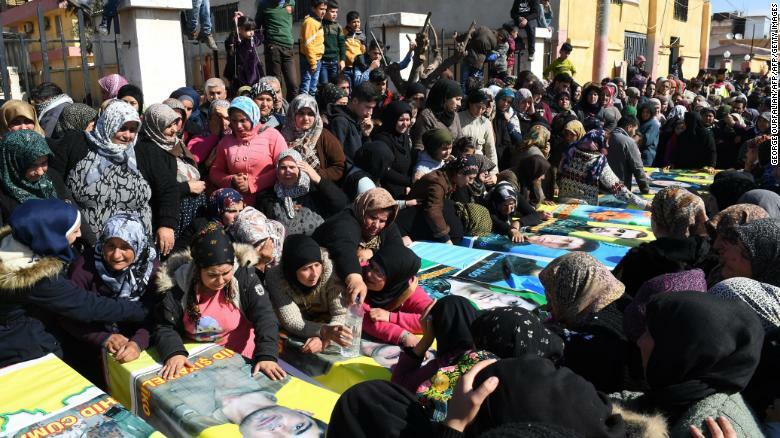 The Turkish air force has conducted strikes against the U.S.-backed Syrian Kurdish militia north of the besieged city of Aleppo, killing at least 160 members of the militia, Turkey’s state-run news agency said Thursday. The military conducted the raids late Wednesday and targeted 18 Kurdish positions in the Maarraat Umm Hawsh region, according to Anadolu news agency. The strikes mark a significant escalation in Turkish action against Kurdish forces in northern Syria and are likely to exacerbate tensions between Ankara and Washington, two NATO allies. Sign up Sign up to our daily newsletter for up to date global news and features. It comes as Iraqi and Kurdish forces are battling to liberate the Iraqi city of Mosul from the Islamic State militant group (ISIS) and Ankara instead backs Syrian rebels against ISIS in northern Syria, ratcheting up tensions with Kurdish forces who had also made advances against the radical Islamist group. Turkey is suspicious of Kurdish intentions in northern Syria. The Kurdish YPG militia says it is defending the region from ISIS, beating them back into Raqqa province near its de-facto capital of the same name. But Ankara views Kurdish advances as an attempt to join up two administrative blocs to form a semi-autonomous state, known locally as Rojava, on the country’s southern border. Turkey opposes any Kurdish moves towards self-determination, viewing the militiamen as linked to the Kurdish militant group outlawed in Turkey, the Kurdistan Workers’ Party (PKK). The group has waged a decades-long insurgency against Turkish authorities in a conflict that has left tens of thousands of people dead. A fragile two-year ceasefire between the PKK and Turkish forces collapsed in July 2015, leading to further PKK attacks and a Turkish military operation in southeastern Turkey’s predominantly Kurdish areas. 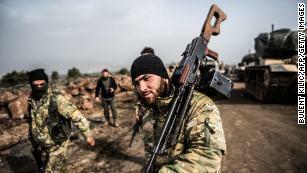 Turkey subsequently sent Syrian rebels into northern Syria in August to oust ISIS from territory but to also slow Kurdish advances in the region and prevent what it viewed as a land grab. While Turkey views the YPG as an extremist organization, Washington views them as valuable partners on the ground in the battle against ISIS, and the most effective fighters to combat the group in Syria.